As I write this, we’ve had our new girls in our home for twenty days. Twenty glorious, noisy, dramatic, wonderful days. As parents for 26 years, John and I are used to noise, to mess, and to drama, but adopting teens from foster care takes this to a whole new level … in a good way. Currently, John is out of town for work and last night we Skyped with him. In addition to our new teens ages 15, 12, and 12, we also have three little ones at home ages 7, 5, and 4. So please picture six excited faces (mine makes seven) crowded in front of the computer trying to chat with Dad. From the other side of the world, John was soaking it all in. “There is so much life at home,” he said with a smile. That’s a good way to sum it up. When John and I first thought about adopting again, we knew we wanted older kids who would soon be aging out of foster care. We also knew we wanted to adopt a sibling group. We knew that sibling groups are harder to place. We also knew we wanted some of those siblings to be girls, because girls are SO vulnerable when they age out of foster care. And while we thought in generalities, God had four specific girls in mind. (The fourth will be moving in later this summer.) We have no doubt God put that desire on our hearts for a reason. We can’t imagine our life without these girls. 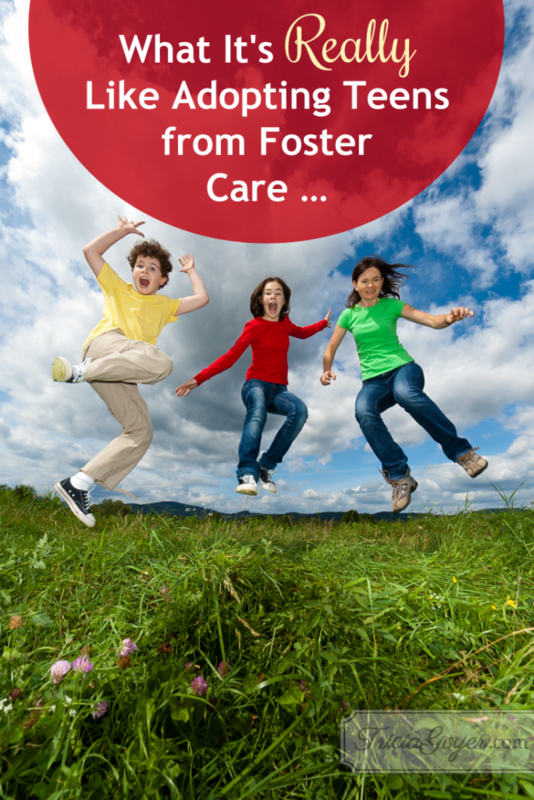 So what is it really like adopting teens from foster care? My heart aches when I hear about the pain in their past. I’m sad that I wasn’t there to hold them during hurts. I’m sorry they had to go through what they did, while at the same time, I’m thankful that I can hear their stories and attempt to understand. That sadness is mixed with excitement of discovering the personalities of each kid. There is joy in feeling the connections and bonds growing. There is hope that our family unit will continue to grow strong. There is love. Growing, intertwining, deepening love. I can’t think of a better word to describe it. Despite the emotions and drama, despite the paperwork, the DHS visits, the check-ins and home studies, there’s a sense that this is good, this is right, and this new sense of family makes God smile. Those who were once not-a-family are now a family. Those who were orphans—wards of the state—are now cherished children. Those were apart are now together, with God in the center. His Spirit is here in the midst of the noise and mess, and He is pleased. I feel that pleasure. Those are the three top things that came to mind when I thought about how this adoption is going. Do I have any regrets in choosing to adopt teens? Not one. Am I falling in love with these kids? Yes, very much. Do I get overwhelmed and tired at times? Everyone would nod yes to this one. Mom does get tired and cranky! Is it hard figuring out how to deal with teen issues in today’s world? Yes! Even though I’ve raised three kids to adulthood, raising teens today is different than ten years ago. Each personality is different, too. I’m still trying to figure it out! Will I have to give up some of me to make more room for them? I already have. Is it expensive? Yes, they eat a lot and like clothes! What it’s really like adopting teens from foster care is seeing that God had something more wonderful planned than I ever could have imagined. It’s seeing His way of caring for orphans is hard but beautiful. It’s understanding that while we’re giving a lot we’ve been given some pretty amazing gifts. I’m so thankful that these gifts now call me mom. Congratulations on your growing family. You have a lot of love to give. God Bless you. I’m glad to hear that everything is going well for you and the kids. We love and miss them, but I’m so glad that God finally gave them a good family and a place to call home. I know He will guide you as you figure out all of the personalities and deal with the drama. Oh, and believe me, there WILL be drama! 🙂 Please tell them Mr. Curt and Mrs. Danna love them and said hello. Yes, drama!! I’ll tell them! I enjoyed the article! God Bless You & Your Family! Tricia, I’m so happy for your family and all the new kids you have. I can’t wait for that fourth girl to be able to move in. Won’t that be a very happy reunion? Enjoy! I have to admit, I was a little worried when I found out someone else was going to adopt “our girls” , but after hearing so many wonderful things about you and your family, praying hard, and then finally being blessed to meet you, I have no doubts left that the Goyers where the perfect family to be blessed with this precious cargo! Please tell the girls miss Leslie loves and misses them! We adopted our Daughter when she was 13, and she had so much baggage & we endured lots of drama!! Now that she is 26 & has 3 beautiful little girls of her own who call me “Grandma” I look back & think it was so worth it!! Hang in there – I know you & John will be great parents to them & you will be so Blessed! Found this on Pinterest- I was not expecting to read such an encouraging and inspiring post. Thank you! This is beautiful. God bless your family richly.